Quality Air Heating and Air Conditioning > Articles > Air Conditioning > Why Might an Air Conditioner Short Cycle? Why Might an Air Conditioner Short Cycle? The heat of summer is something that most of us can agree on enjoying. However, it is a lot more difficult to truly enjoy the heat of summer if you are not able to relax in a cool, comfortable environment upon arriving back home after a day of fun in the sun. Unfortunately, there is no guarantee that your air conditioning system is always going to operate precisely as it ought to. There are a lot of problems that you may encounter with your air conditioning system, including short cycling. 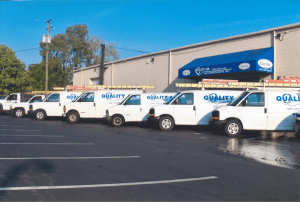 The most important thing to remember when you encounter problems with your home cooling system is that it is always in your best interest to schedule prompt air conditioning repairs in Columbus, OH. Have you noticed a situation in which your air conditioning system is starting up when your home gets too warm, but then it shuts down again shortly thereafter, failing to run through a full cooling cycle, only to register warm temperatures again and start back up? If so, your air conditioner is short cycling. This is as annoying as it sounds, but the issues cause by short cycling go further than simple annoyance. This issue can drain your budget, as your system will use more energy than it should due to continuously restarting, meaning that you’ll be paying more for less comfort. Plus, short cycling can put a lot of strain on your system, increasing the risk of encountering repair needs. If your air conditioner has always suffered from short cycling, it is probably oversized and is cooling your home too quickly. This is unfortunate, as there is no way to simply repair this situation. You’ll have to replace your AC with a more appropriately sized system. However, if you’ve just recently run into short cycling, you may have a failing thermostat that is feeding your system inaccurate temperature readings. Perhaps you have a faulty run capacitor, which is failing to maintain proper current in the system’s motor. Whatever your AC repair needs may be, you can count on Quality Air Heating and Air Conditioning to get the job done right.